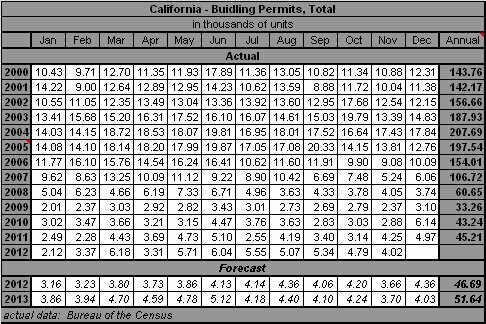 With data through November of 2012, the total number of Residential Building Permits issued in California should end 2012 with a 23.5% (10,600) increase from the 45,200 permits in 2011. This was the third consecutive year of increases, prior to this increase, total permits had declined from a high of 207,400 permits in 2004 to a low of 33,300 permits in 2009 - an 84% decline in 5 years. The decline is larger, percentage-wise, than the 74% decline during the 1987-1993 period. The forecast for 2012, based on actual permits reported through November, 2012, is for the 23.5% increase, followed by a 7.5% decline in 2013. The number of Single-family Residential Building Permits issued in California ended 2011 with a 10.9% (2,700 permit) decline, to a low of 22,200 single family permits issued. This followed the 3.3% (800 permit) increase to 24,900 permits issued in 2010. Prior to this increase, Single-family Residential Building Permits had declined from a high of 151,600 permits in 2004 to 24,100 in 2009 - an 84% decline in 5 years. The decline is larger, percentage-wise, than the 52% decline during the 1987-1993 period. Single family permits declined while total permits increased in 2011 because of the emphasis in multi-family housing in the state. 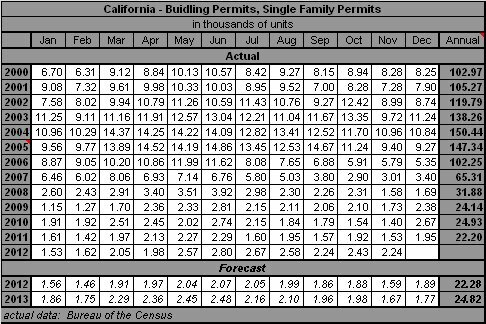 The forecast for 2012, based on permits filed through November, 2012, is for a 19.8% increase, followed by a 6.7% decline in 2013.